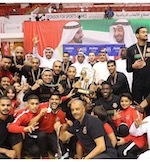 Mighty Sports cruised past American University in Dubai (AUD), 87-58, in the opening game of the 30th Dubai International Basketball Championship held inside the Shabab-Al Ahli Club. The Philippine representatives to the 10-team tournament fashioned out the 29-point beatdown over an overmatched AUD side behind the exploits of imports Justin Brownlee (197-F-88, college: St.John's) and Randolph Morris (211-F/C-86, college: Kentucky) and Fil-American Jeremiah Gray (193-G, college: Dominican, CA). An alley-oop slam by Gray off a feed from Jason Brickman gave Mighty Sports a huge 49-20 advantage at the start of the third quarter. The 6-foot-5 guard scored on a dunk once more in the latter part of the period to the delight of pro-Filipino crowd composed mostly of migrant workers. The game also marked the return to competitive basketball of former National Basketball Association (NBA) player Lamar Odom (208-F-79, college: Rhode Island). The 2011 Sixth Man of the Year and two-time NBA champion started at the power forward spot and finished with four points and seven rebounds. Still groping for form, the 6-foot-10 forward made just two of his 10 field goal attempts while missing all of his five three-pointers. Still, the Filipino fans urged Odom to continue finding his offensive rhythm up until the fourth period. At the final 7:24 of the game, Odom scored on a nifty layup that was greeted with cheers by the crowd. Brownlee led the way for Mighty Sports with 17 points and six rebounds. Gray and Morris chipped in 15 and 14 markers respectively. Mahmoud Rab of AUD tallied game-high 20 points on 9-of-19 shooting from the field, along with seven rebounds. In less than 24 hours, Mighty Sports return to action to battle the UAE National Team in the resumption of the elimination rounds.